Ruby 2.4 support! RubyEncoder 2.4 launched! We have added full support of encoding for Ruby 2.4 including all the newest language features. In order to encode for Ruby 2.4, please select an appropriate checkbox in your project settings or use the --ruby 2.4 option if you prefer to use the command line encoder. As usual you may combine encoding for different versions of Ruby but your code must be compatible with all the selected versions. Please note, as Ruby 2.4 is not supported by RubyInstaller.org at the moment of releasing RubyEncoder 2.4, loaders for MinGW (rubyinstaller version) are not included to the installation package. Once the new version of RubyInstaller becomes available, we will build updated loaders for MinGW Ruby 2.4 and make them available for downloading from our loaders page. Dependencies on GLIBC 2.6+ removed from encoders for Linux. This must help running RubyEncoder on some old Linux systems. Fixed issues with searching of the license file if the path to the encoded Ruby script contains non-ASCII characters. Only Windows versions of the loaders were affected. Also this includes fixes and support of non-ASCII in RG_LIC_PATH too. Technically it means UTF8 support on Windows in paths to encoded files, license files and in RG_LIC_PATH. Fixed the old float values issue in the old Ruby 1.8.x 64-bit encoder for Linux. The issue was caused by the problem in Ruby code itself and particularly ruby_strtod() function. If you use 64-bit RubyEncoder on Linux for encoding Ruby 1.8.x scripts, this is a sample code to check: 'puts Math.log(0.5)'. If your code is affected by that problem, please re-encode it with RubyEncoder 2.4. Fixed encoding of only files changed since last encoding in GUI. This must work now without re-opening the project. Loaders were updated for Mac OSX, Linux and Windows (MinGW loaders for Ruby installations from rubyinstaller.org). Loaders are included to the new installation packages or you may download then from our loaders page. 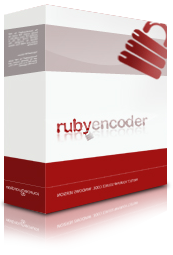 We added a section about encoding of Ruby on Rails applications to our User Manual.